It is a long-standing puzzle why predicates like believe embed declarative but not interrogative complements (e.g., Bill believes that/*whether Mary left) and why predicates like wonder embed interrogative but not declarative complements (e.g., Bill wonders whether/*that Mary left). 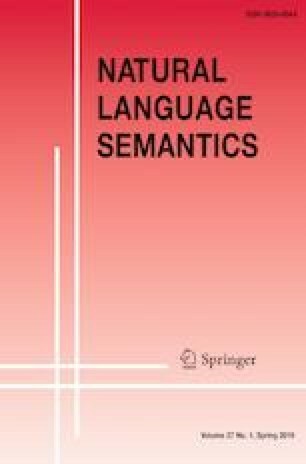 This paper shows how the selectional restrictions of a range of predicates (neg-raising predicates like believe, truth-evaluating predicates like be true, inquisitive predicates like wonder, and predicates of dependency like depend on) can be derived from semantic assumptions that can be independently motivated. We wish to thank two anonymous reviewers and our editor, Angelika Kratzer. Moreover, we are very grateful to Ivano Ciardelli, Michael Cohen, Alexandre Cremers, Donka Farkas, Clemens Mayr, Wataru Uegaki, and Yimei Xiang, as well as audiences at the University of Amsterdam, the University of Konstanz, and SALT for feedback on earlier incarnations of the ideas presented here. We also gratefully acknowledge funding from the European Research Council (ERC, Grant Number 680220) and the Netherlands Organisation for Scientific Research (NWO). Ciardelli, I., J. Groenendijk, and F. Roelofsen. 2012. Inquisitive semantics. NASSLLI lecture notes. http://projects.illc.uva.nl/inquisitivesemantics. Ciardelli, I., J. Groenendijk, and F. Roelofsen. 2015. Inquisitive semantics. ESSLLI lecture notes. http://projects.illc.uva.nl/inquisitivesemantics. Roelofsen, F. 2013b. An inquisitive perspective on meaning: the case of disjunction. http://projects.illc.uva.nl/inquisitivesemantics. Talk presented at Stanford Linguistics Colloquium, February 2013.